In 695, the Byzantine Emperor Justinian II, son of Constantine IV (668-685), grandson of Constans II (641-668), great grandson of Constantine III (641) and great great grandson of the dynasty’s founder, Herakleios (610-641), was violently deposed. To prevent him returning to power, his tongue was slit, his nose cut off, and he was then exiled to the city of Cherson in the Crimea. Unfortunately for the people who had deposed him, Justinian II came back in 705 to rule again until 711, when he was deposed for a second time. 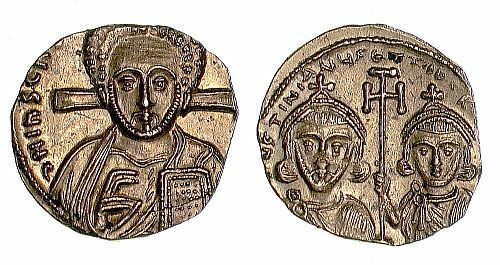 Coin B4467, a gold tremissis from Justinian’s second reign, shows Justinian alongside his son, Tiberios, on the reverse, and an image of Christ on the obverse. On this particular coin, however, someone has chipped off Justinian’s nose! Probably not something one would want to be caught with on one’s person at the time – although the coin may have been defaced after Justinian was deposed for the second time.